Bad Luck Ally strikes again. This is a running joke with me. Bad Luck Ally has a constant stream of bad luck. Luckily (ha!) it’s little bad luck. If you’re going to have bad karma, I guess it’s better to have a little bit of bad luck every day than have one big bad luck, right? Bad Luck Ally strikes at the drug store, when I run in to grab my specific brand of tampons and they are the only ones sold out on the shelf, or when I’m late and looking for a parking space, and always ALWAYS when I’m trying to make it through a stoplight. In fact, Bad Luck Ally has become such a joke at work, no one will sit at my table when door prizes are being drawn. All of this build up is to tell the tale of Bad Luck Ally and the Dump Trucks. You’ve seen the dump trucks that say “stay back 200 ft” and “not responsible for windshields,” correct? Well, I actually keep my distance from these things because we all know that if it’s going to happen, it’s going to happen to Bad Lucky Ally. 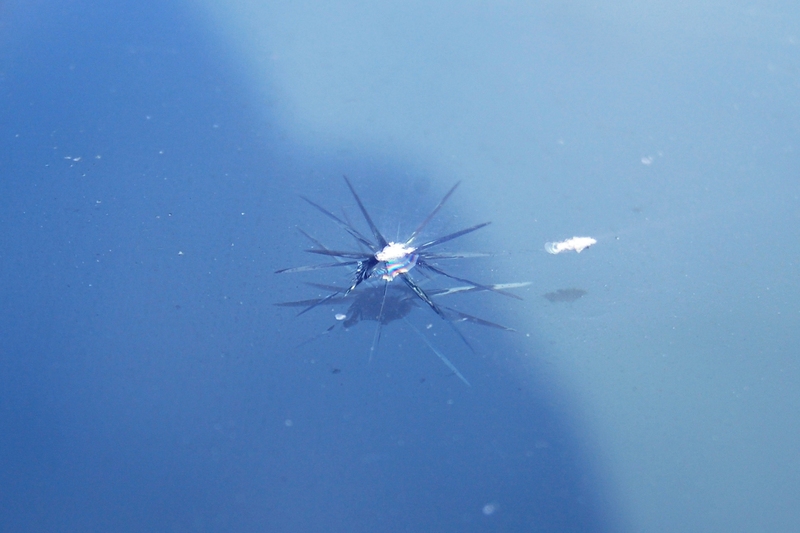 About two months ago, while driving over a drawbridge, a dump truck passed by going the opposite direction and rock flew out and chipped my windshield. Yes, it’s true. I was minding my business in my own lane and a truck spit out a rock as he passed by. I realize that could happen to anyone. It was a small chip, and I didn’t bother fixing it. What takes the story from normal bad luck to Bad Luck Ally is the fact that Monday afternoon I was smacked by a dump truck rock…again! This time, I was driving in the left lane and the truck was in the right lane. As I passed him, 3 rocks (one quite large) flew out and hit my windshield. One barely dinged, another chipped, and the third and largest left the beautiful crack you see above. Maybe Bad Luck Ally has had little back luck her whole life because karma is saving up for one big good luck one day. That’s what I should keep telling myself, right? P.S. I would have posted this yesterday, but I managed to get a friendly little computer virus. Nice. It’s too long, and when it gets too long it gets very flat and unflattering. I usually grab a morning shower and let it air dry into part-waves, part-straight, part-frizz. What were once sideswept bangs are now layers dipping nearly to my shoulder. At age 22, when I was bracing myself for life after college graduation, I decided to take the plunge and donate my hair. As a biology major (specifically, interested in ecology), along with my classmates I spent my senior year looking quite crunchy. In fact, I don’t think I even had a trim in nearly a year, and I rarely touched a hair dryer. As a result, my hair spilled a few inches below my bra strap by the time graduation rolled around. I’ll supplement this with pictures if I can find some. At the time, the only program I knew about was called Locks of Love. The requirements were simple: no hair dye, minimum of 10 inches. After the chop chop my neck felt freer but my ego took a hit. As someone who spent most of her life with shoulder-length or longer hair, my new barely-past-chin look was not at all flattering on me. My normally gently round face took on a new basketball quality. The cut itself was cute, but it just didn’t work on me. So, you may ask, why am I considering torturing myself this way again? This time, I plan to donate to a different program – Pantene Beautiful Lengths. The requirements are similar – no permanent dye, but only 8 inches are needed to donate. My hair has grown to about the same post-college length (this time more out of laziness than crunchiness) and eight inches would put it right above the shoulders. Still too short for comfort, but long enough I don’t want to waste it. So, now all I have to do is wait and suffer through this stringy mess a few more months. A couple more inches would result in a shoulder length cut I can live with, and hopefully help someone out at the same time.